Having thousands of followers is great, but unless you’re able to keep them engaged it’s irrelevant. You need to share relevant content that resonates with your audience and gets them to take action. 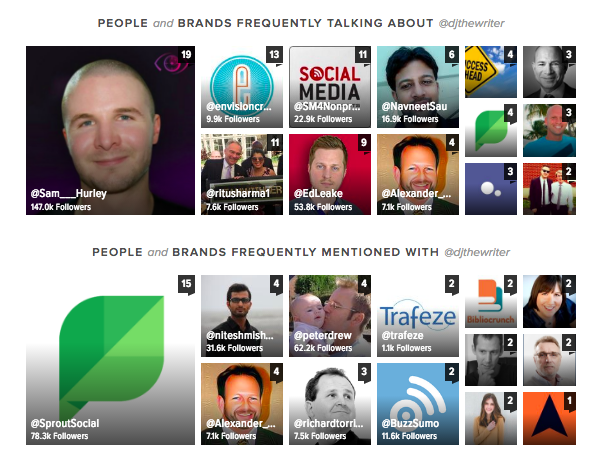 To get started, you can analyze Twitter followers to learn more about who’s following. So much attention gets put on the number of followers, but very few businesses take the time to understand their audience. You may think you know what to share, but until you analyze your Twitter followers you’re just making assumptions. Going through all of your followers and doing a manual review is too time consuming and inefficient. Instead, use a tool that’ll allow you to analyze Twitter followers. The more data you can pull, the better. 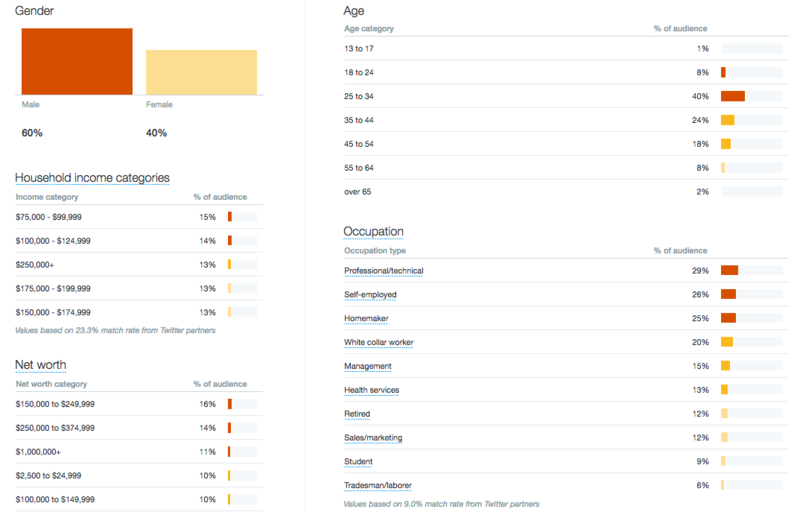 Twitter’s native analytics give you some great information on the demographics of your followers, which is a great place to start. In order to find out more information beyond demographics, it’s helpful to use a third party tool. For instance, Sprout’s Twitter analytics will allow you to see important data about your followers like engagement, popular hashtags, conversation history and more. And Buzzsumo is great at analyzing potential followers. Between Twitter, Sprout and Buzzsumo, you have everything you need to dive in and start analyzing your followers. Now that you have your toolkit ready to go, here’s how to analyze Twitter followers effectively. A while back, Twitter revealed that over 20 million of its users were bots. With that many automated accounts, it’s likely that you have at least a small percentage of bots following you. Although these accounts beef up your follower count, they don’t add real value. While some brands intentionally use deceptive tactics like buying fake followers, you could be Tweeting to an audience of bots without even knowing it. These bots mass follow random accounts to appear like real users. So if your account ends up on their list you could be one of the people they follow. The first step in analyzing your Twitter followers is spotting the fakes. Aside from not wanting to look sketchy an deceptive, one of the main reasons you want to find your number of fake followers is because they can skew your data. For instance, if your Twitter analytics show your audience is 70% male but 30% of your followers are fake, that number might not be entirely accurate. Here’s a handy tool you can use to get an idea of how many fake followers you have. These numbers might not be exact, but it’ll give you a rough idea to start with. If a large percentage of your followers are bots, you’ll probably want to work on growing your audience first. Unfortunately you can’t force bots to unfollow you, but you can try asking, or report them if you’re completely sure it’s a bot. Again, having a few bots follow you doesn’t necessarily harm your account. But the more real followers you have, the more accurate your analysis will be. What Do Your Followers Tweet About? After you’ve identified how many real followers you have, the next step is to learn what topics they’re Tweeting about. This will help you cater your content to what your audience wants to see. The more they resonate with your Tweets, the more likely they’ll be to engage. To analyze your Twitter followers’ interests, you can manually go through and browse each followers’ timeline. But that’s going to take you a long time. Alternatively, you can use Twitter’s analytics to get a high level view of what your followers are interested in. You can go one step further and see what people are Tweeting about when they mention your brand. 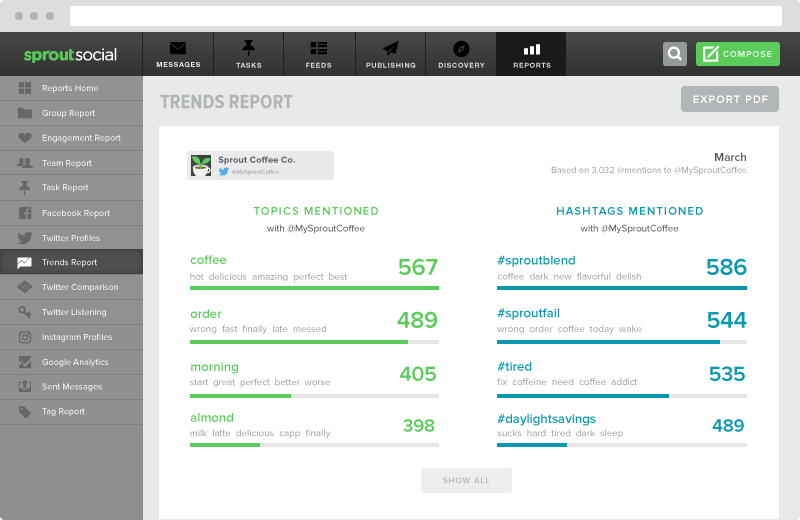 Sprout’s Trends report shows you what topics and hashtags people use the most when they Mention you. Between these two reports, you have the ammo you need to create and share more of the content your followers actually like. Also, by understanding the hashtags and topics your followers Tweet about, you’ll increase your chances of being discovered by new people who are searching Twitter for the same keywords. When Are Your Followers Active? It’s already been well established that Twitter is probably the noisiest social network. At any given second hundreds of new Tweets can fill up your feed. As a result, your Tweets are seen by fewer people and you get less engagement. In order to counteract this, try to learn the Tweeting habits of your followers. Tweeting when your followers are active increases the likelihood of getting them seen. Most of your followers won’t see your Tweets, but the goal is to increase your chances as much as possible. So how do you find the best time to Tweet? There has been a lot of research into when to Tweet for the most engagement. While that data can give you a decent starting place, keep in mind they’re just averages. Your followers may not be on Twitter during the times these studies deem to be the most active. You need to find out when your followers are most likely to engage. There are a couple of options to do this. 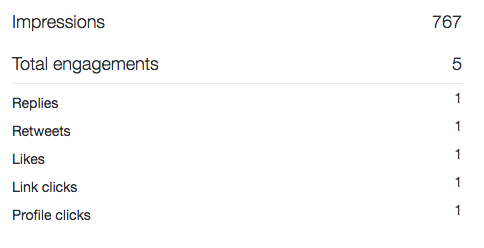 First, you can look through your Tweets that earned the most engagement and record what time they were sent. However, this takes up a lot of time. In order to get enough information to spot a trend you’d need to look at hundreds of Tweets. Plus, this tactic is only effective if your Tweets are already getting engagement. 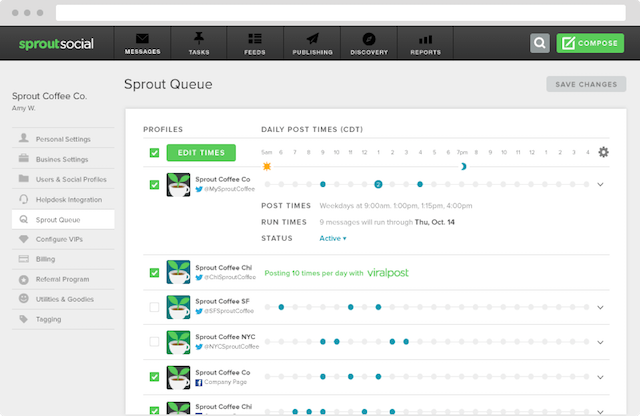 The second approach, which is much more efficient is to use Sprout’s ViralPost feature. ViralPost finds the best time to Tweet based on when your your followers engage the most, and when other people aren’t Tweeting. That’s the sweet spot. Then it automatically schedules your Tweets in those time slots. Which Influencers Are Following Me? Connecting with influencers is a great way to grow your audience and become an authority in your industry. But in order to get the most out of your relationship with an influencer on Twitter, you need to engage with them. Although influencers are well known and having them as a follower is valuable, Twitter doesn’t send a special notification to let you know once one is following you. You’ll get a regular notification like you would with any other user. So it’s up to you to analyze your Twitter followers and spot the VIPs. You may have an idea of the more well known influencers in your industry, but what about the people who aren’t as well known but have a significant Twitter following? Instead of manually checking Twitter every time you get a new follower notification, try one of these options. Use Buzzsumo to see if any influencers are sharing content from your site. Copy the URL of one of your top posts, paste it into Buzzsumo’s content research tool and run a search. Then click on View Sharers to see a list of all the people that Tweeted a link to that particular post. This could be a mix of people who follow you as well as some that don’t. Now you can go through your list and find influencers who have shared your content. Give them a follow and start engaging with them. Since they’ve already interacted with you in the past, you know they’re interested in your content. Now you can focus on building out genuine relationships rather than reaching out to people cold. In addition to finding the influencers who are already following you, get on the offense. Be proactive by finding influencers and getting them to follow you. Read through our guide on how to identify social media influencers and put together a list of accounts to follow and start a campaign to compel them to follow you. One of the best things about getting influencers to follow you is it adds validity to your brand. When people see you’re followed by other influencers they respect, they’ll be more likely to follow you too. After getting some high profile accounts to follow you, analyze your overall followers and see if they’ve resulted in any additional followers. Which Followers Engage the Most? Influencers aren’t the only followers that matter. If your customers are frequently mentioning and engaging with you on Twitter, the worst thing you can do is ignore them. 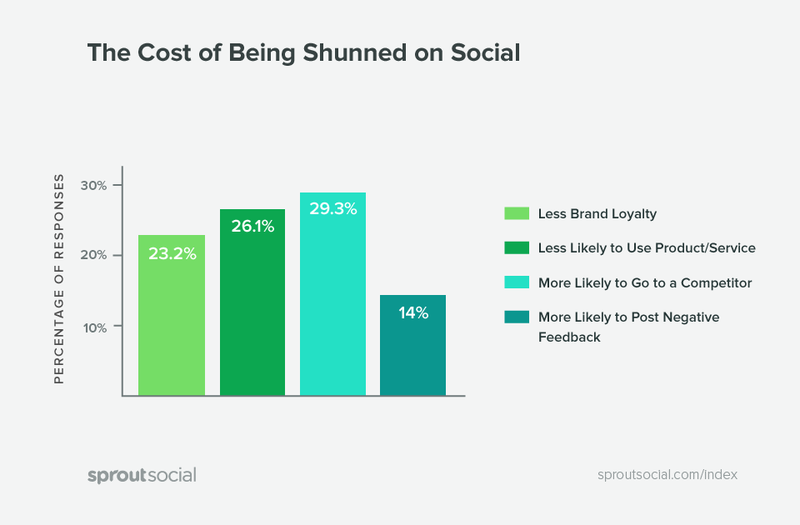 Our Q2 2016 Sprout Index looked at the affects of shunning customers on social media, and the results are not pretty. As you can see, you risk losing brand advocates, receiving negative feedback and eve ending potential customers to your competitor. Make sure you’re acknowledging your top engagers, regardless of their follower count. Sprout’s Trends Report shows which users are engaging with you the most, as well as the users that are frequently mentioned with you. Use this report as a way to look for co-marketing opportunities, get ideas for user-generated content or just to highlight your loyal brand advocates. Analyzing who’s following you on Twitter is important. But knowing who’s mentioning and promoting your account is just as valuable, if not more. What Type of Content Resonates With Your Followers? We’ve analyzed what your followers are Tweeting about, which gives you a pretty good idea of what you should be sharing. But we can also find out exactly what type of content is resonating with your followers by analyzing your past Tweets. The goal is to find the topics and types of Tweets you’re sharing that are driving the most engagement. The quickest way to do this is to look at your sent Tweets history in either Twitter or Sprout. Twitter’s analytics show you how many impressions, clicks and overall engagement your Tweets are receiving. 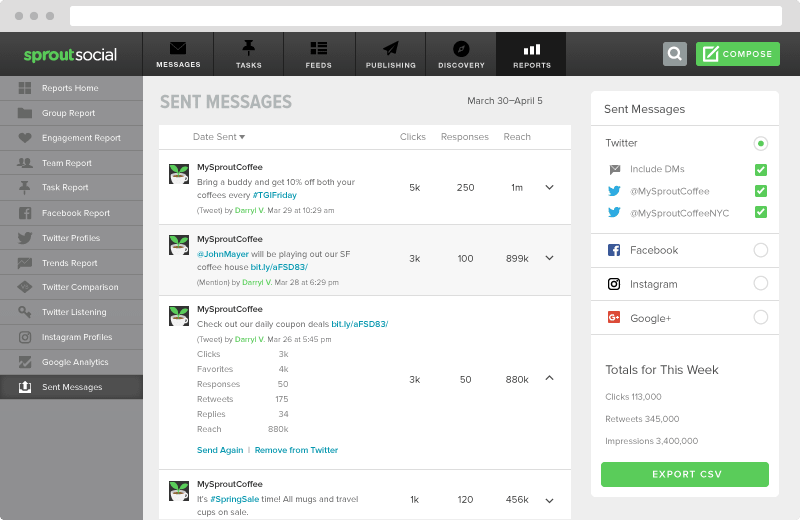 You can find this information in Sprout as well in the Sent Messages report. Keep in mind that the metrics you should be monitoring here are the ones related to engagement. Impressions and reach aren’t as important here because they show how many people may have seen your Tweets. You need to know which Tweets are getting your followers to take action, not the ones that are just being seen. 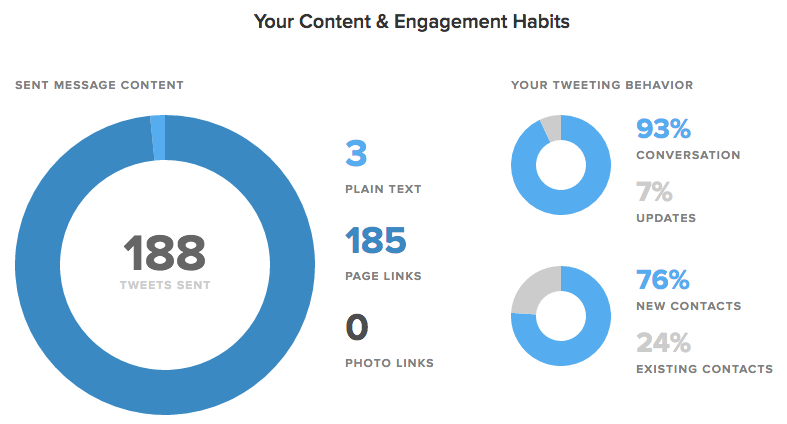 Another cool stat to check in Sprout is your content and engagement habits. This shows the types of Tweets you’re sending out. Look at what type of content you’re sharing the most. Are you Tweeting photos, articles or just regular text links. Then compare that against your engagement stats. If you see an increase from sharing more articles or photos, you’ll have a better idea of what’s working best. Try mixing up the types of Tweets you send out and monitor your engagement over time. What Are Your Follower Demographics? We couldn’t write a guide on how to analyze Twitter followers without mentioning demographics. Demographics are helpful for a couple reasons. For one, you need to know if the people following you on Twitter are aligned with your company’s target customer. For instance, if your customer demographic is 18-34 year old males but a majority of your Twitter followers are 45-54 year old females, there’s a disconnect somewhere. Also, knowing your demographics will help you craft better marketing messages targeted to specific people. 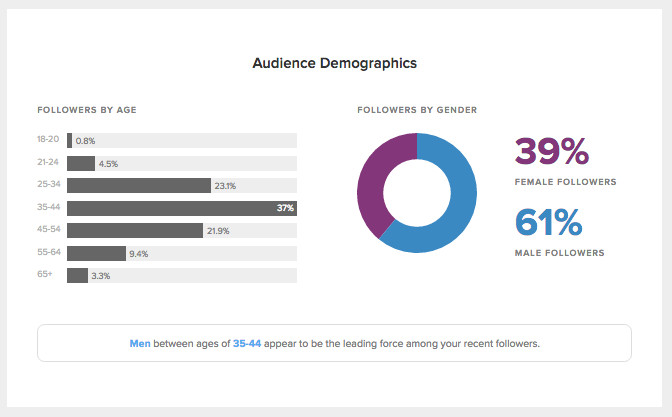 You can find your followers’ demographics in Twitter or Sprout. Now that you know what to look for, it’s time start analyzing. Go through the steps above and start learning about who your audience is. But don’t get stuck at the analysis stage. Put your findings to use and improve your Twitter marketing strategy.